The impact of a fall can linger long after the initial scrapes and bruises have healed. 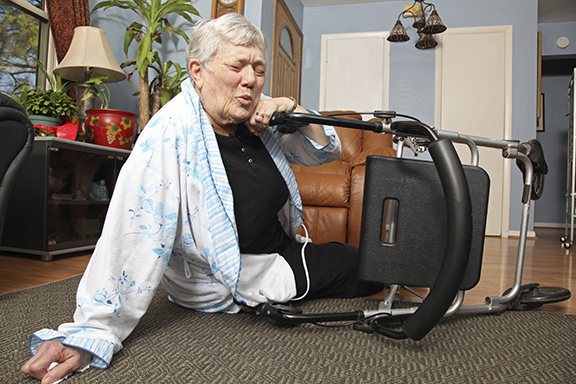 In fact, the effects of falls are often farreaching and devastating. “For many older adults, a fall is the beginning of a downward spiral,” says Anna Cooper, Clinical Practice Leader/BPSO Lead at Bayshore HealthCare. “It can trigger a series of other things – hospitalization, surgery, loss of independence. Even if injuries aren’t serious, a fall can cause people to lose confidence and limit their activities. Their quality of life suffers, and other health problems may develop or worsen. You wouldn’t think one fall could do that, but we’ve seen it time and time again – it’s typically the event that completely changes the picture for seniors.” Many Canadians don’t realize how serious the consequences of a fall can be, adds Katie Schinkel, an occupational therapist and Director of Therapy & Rehab at Bayshore Therapy & Rehab. “People aren’t aware that a serious fall can lead to complete dependence, with seniors ending up in a long-term care facility because they can’t go home again.” Falls can create stress and financial hardship for seniors and families, and they have a high cost for Canada’s health system, too: each year, they incur $2 billion in direct health care costs. For more information about preventing falls, read “Healthy Steps”, a helpful guide from Bayshore HealthCare’s OptimaCuraTM Clinical Programs.